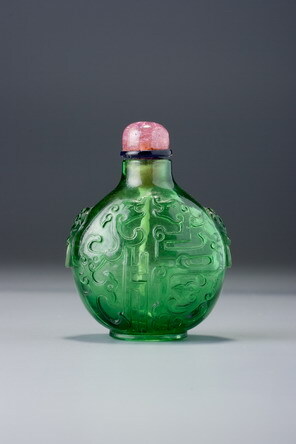 This is a unique emerald-green glass version of the type discussed under Sale 4, lot 41, of which it may be one of the earlier examples. The designs are very similar, suggesting one must have inspired the other or both were inspired by a common design—possibly one drawn up for Imperial approval before being sent to the lapidary workshop. 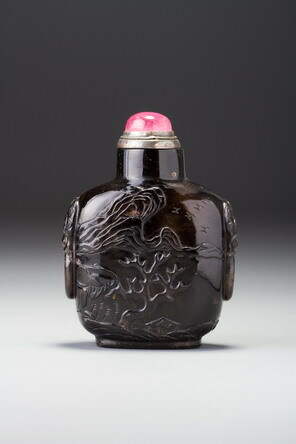 The bottle is the fattest of those recorded, and of a colour we know to have been produced from the very early years of the Imperial glassworks, although others can be dated to the Qianlong era. The size of the rings on the mask handles offers a further clue, for these are the smallest in relation to the masks of all the known examples. We propose this as a sign of early style in this popular feature, hence the slightly earlier date range in this instance. Despite the variation in colour and bulbousness of this series, the bottles are of uniformly high quality and exhibit supremely confident carving. They represent the epitome of eighteenth-century glass carving from the Imperial glassworks, although the formal nature of their designs may make them seem less exciting than more dynamic subjects carved to a similarly high standard.